TALBOTT, Joshua Frederick Cockey, a Representative from Maryland; born near Lutherville, Baltimore County, Md., July 29, 1843; attended the public schools; began the study of law in 1862; joined the Confederate Army in 1864 and served as a private in the Second Maryland Cavalry throughout the remainder of the Civil War; was admitted to the bar in 1866 and began the practice of law in Towson, Baltimore County, Md. 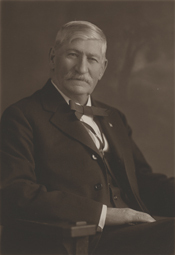 ; prosecuting attorney for Baltimore County 1871-1875; unsuccessful candidate for reelection; delegate to the Democratic National Convention in 1876, 1904, and 1908; elected as a Democrat to the Forty-sixth, Forty-seventh, and Forty-eighth Congresses (March 4, 1879-March 3, 1885); was not a candidate for reelection in 1884; appointed insurance commissioner of Maryland in October 1889 and resigned in January 1893, having been elected to Congress; elected to the Fifty-third Congress (March 4, 1893-March 3, 1895); unsuccessful candidate for reelection in 1894 to the Fifty-fourth Congress; resumed the practice of law in Towson; unsuccessful candidate for election in 1900 to the Fifty-seventh Congress; elected to the Fifty-eighth and to the seven succeeding Congresses and served from March 4, 1903, until his death in Lutherville, Md., on October 5, 1918; interment in Sherwood Cemetery, Cockeysville, Baltimore County, Md. Papers: In the Pleasant Hunter Family Papers, ca. 1860-1870, 105 items. Correspondents include Joshua Frederick ("Fred") Cockey Talbott.